As part of our month-long real estate theme, we’re looking at a range of terrific kitchen and bath products this week—all easy updates to help boost your home’s value. We're highlighting designs that offer timeless silhouettes, neutral palettes and a feeling of luxury. But first, check out this two-minute video on the renovation of the kitchen at John Lautner’s Garcia House on Mulholland Drive, done with Marmol Radziner, Darren Brown and Dacor's new Modernist collection. And while we’re not all renovating architectural masterworks, this project a great example of incorporating brand-new designs that feel immediately at home. BlueStar’s sleek and classic French Door Built-In Refrigerator is one of the newest designs to join the company’s award-winning refrigeration line. (It’s been a top pick for Better Homes & Gardens and Interior Design magazines.) With durable stainless steel interiors, dual compressors for enhanced food preservation and roomy interiors, it’s a great option for those who love to cook and entertain. The refrigerator’s fully extending bottom shelf is designed to fit a full-size commercial sheet pan, as is the freezer shelf, making advance prep a breeze. At just 36-inches wide, the design is also ideal for homeowners with tighter kitchen space. With two doors swinging in opposite directions instead of one, wide-swinging door, this new model allows kitchens of all sizes to feel more open and useable. Plus, all refrigerators are available in more than 750 colors and 10 metal trim options. With the recent resurgence of farmhouse styles, we’re seeing a return to traditional farmhouse kitchen sinks—but this time with gorgeous carved details and clever accessories that turn it into a full-blown workstation: cutting boards, colanders, drying racks, etc. We especially love Stone Forest’s Basket Weave and Wave Front designs, as well as their classic New Haven Farmhouse sink. For an equally generous but more streamlined look, consider Rohl’s new line of new black stainless steel designs, available in a variety of sizes. The zero-edge sidewalls and a rounded bottom edge make the sink extremely easy to clean, and because black stainless is less reflective than traditional stainless steel, it’s better at resisting fingerprints and water spots. The black finish makes a bold, contemporary statement, especially when paired with white countertops. And it partners beautifully with Rohl’s new Italian-made Campo faucet, which just debuted this year. Its wheel-like design (which Rohl originally designed for bathroom fixtures) was inspired by industrial valves and is available in myriad finishes. Soaking tubs are at the top of everyone’s wish list and there’s no shortage of shapes and sizes to choose from. One of our favorites is the new Fini-1 from Blu Bathworks, a finalist in Interior Design’s Best of Year 2017 awards. The seamless, freestanding tub has a unique base curvature that makes a statement in any bathroom. 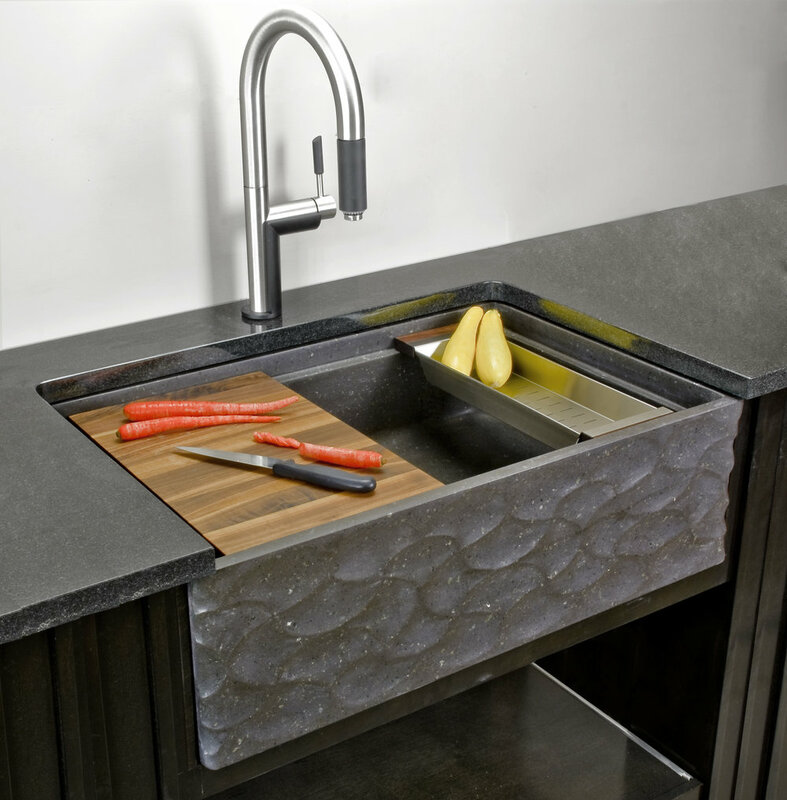 It’s sculpted from the company’s proprietary stone material—and eco-friendly, anti-microbial quartz aggregate. Non-porous, it holds the temperature of bathwater longer to create a more luxurious soak. 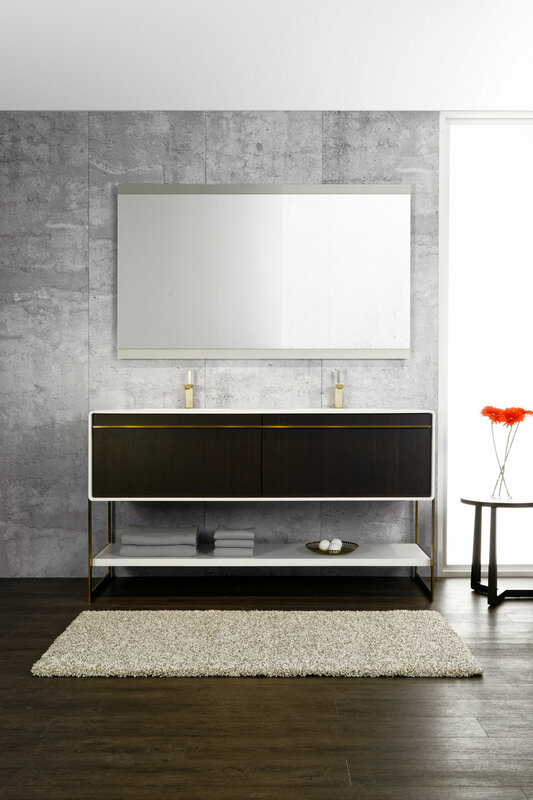 Furniture Guild’s new Avento vanity brings the sophistication of luxury furniture to the bathroom. It’s an elegant and minimalist, and can be customized in a variety of ways thanks to six metal finishes and more than 50 options for panel finishes, including traditional and exotic surfaces, textures and high-gloss acrylics. (Products are made from FSC-certified hardwood and incorporate ¾-inch, pure-bond formaldehyde-free furniture grade plywood.) Plus, the company’s new Fenix countertop material is durable, antibacterial, resistant to abrasion, mold, and fingerprints, and uses thermal healing to remove any scratches. Every design is made to order by a single craftsman and comes with a lifetime warranty. Our favorite aspect? The LED-illuminated drawers. Also new to our bathroom vanity options is Wet Style’s Art Deco collection. 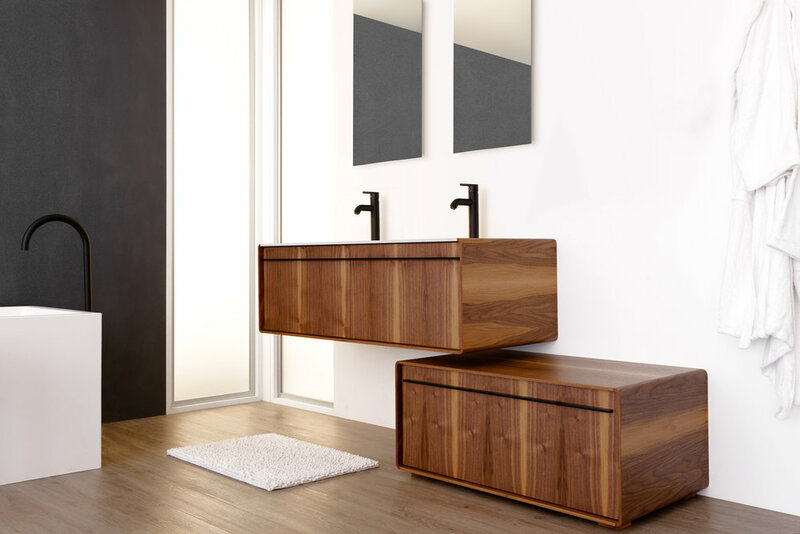 The designs meld smooth counter surfaces with the warmth of wood accents (think natural walnut, eucalyptus and Mozambique) and metals in a range of finishes. The collection is easily suited to bathrooms of any style and can be ordered in three different formats: wall-mounted, floor-mounted and free standing. Matching mirrors make for a finished, cohesive look. And if you’re looking for a more minimal refresh, simply updating cabinetry hardware in your kitchens and bathrooms is a great, fast way to go. Between our collections from Alno, Emtek, Ashley Norton, Edgar Berebi and Colonial Bronze, you’ve got no shortage of designer options. 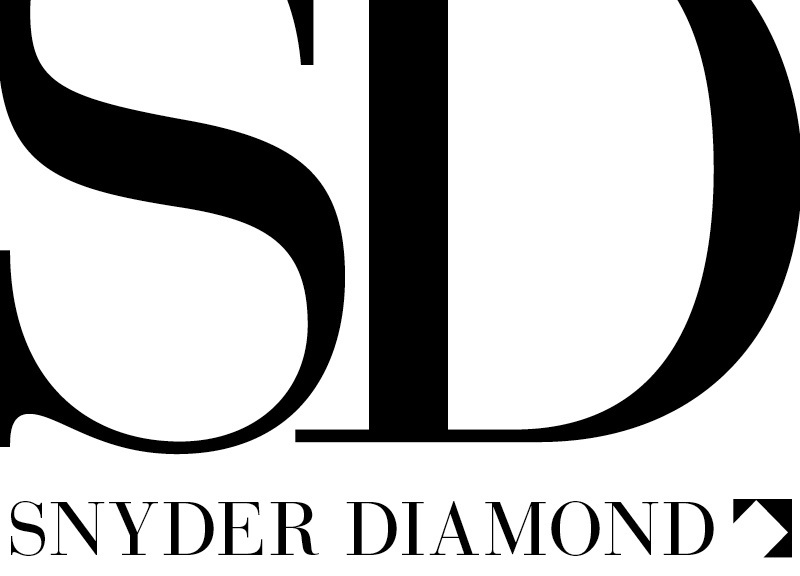 Check out a few of our past posts to see more: High-Style Hardware and Haute Hardware. Unbuilt: Duravit asks that you submit a sketch or rendering of your own bathrooms reimagined, incorporating Duravit's latest series, XSquare & Brioso, into the design. The winner of the Unbuilt Dream Bath Competition will receive the Duravit products included in their design at a value up to $10,000. Built: This category seeks designer projects completed within the last five years and which feature Duravit products of any sort. The winning Built Dream Bath design will receive $5,000 in Duravit items. To learn more, click here. Winners will be announced during Duravit Design Week in early October. We know how talented all of our designers are—enter now and give it a go!